The KIBO 15 Kit builds upon the movement and sequencing capabilities of the KIBO 10 Kit, adding an introduction to programming with sensors and outputs. The KIBO 15 Kit also expands the expressive capabilities of KIBO with an art stage to anchor children's decorations. 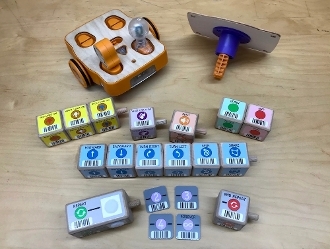 The KIBO 15 contains: one KIBO robot with 15 programming blocks, 4 parameter cards, 2 motors, 2 wheels, 1 sensor modules (sound), 1 lightbulb module, and an art stage. The optional plastic bin is designed for easy cleanup and sturdy storage in classroom environments.